What an excellent and useful pattern!!! I can tell by reading this pattern that it will turn out perfect. Thank you for sharing this a free pattern. Thanks for such a great free pattern. I knit up 2 of these hats in under 24 hours for both my kids! You can knit back and forth for this one and just make a seam when you finish. After the ribbing, purl the even rows. Silly question; if a row ends and starts with k6, does that mean we knit double that between the k2tog and ssk? (Example k6, k2tog, ssk, k6, k6 again, k2tog, ssk, k12, so on and so on) or is it just k#, k2tog, ssk and repeat til end of round? Double. So k12 between the decreases. You are absolutely right – it does not. Thank you for pointing this out. I reworked that size for a 72 stitch cast on so that it will come out correctly for the 2×2 ribbing. Thank you!!!!! This looks perfect for what I needed, so clearly written as well, thanks for sharing!!! The 47 inch circular needle is for doing the “magic loop” method of knitting-in-the-round for a small circumference. The body of this hat can be made on a smaller circular (12″ or 14″ or 16″) but would need to be moved to double pointed needles or some other way to handle smaller circumferences once working on the crown. Thank you for sharing your pattern. It was exactly what I waas looking for. However, the decrease instructions caused me problems. The K2tog, ssk did not work together. I had to eliminate the ssk and proceed without. The k2tog decrease worked as with other beanie patterns. I’m a beginner, but beyond the simple scarf stage and I really want to try this hat! Just wondering, is it possible to do this hat on regular circular needles, assuming you have the right size (16 inches for example)? Im planning to make the small adult size. Thanks! You can until you get to the crown. The crown gets smaller and smaller around, so a method for knitting in-the-round in small circumferences is needed at the top of the hat. Hi I’d like to make this hat in adult large, but his head circumference is 22.5 inches, not 23.25. Would your recommend I cast on fewer stitches than the pattern calls or do you think it will still fit if I just follow the pattern? Thanks! I am not an expert in slouchy beanies, but did look through several patterns and to me it just looked like they were making a basic beanie but longer. So I think you could just make the body longer before starting the crown. hi can someone help me understand understand the ssk? Love all of your patterns. How would I change the pattern for this beanie and the diagonal hat to use worsted weight rather than the bulky yarn? I will post the modifications for the Diagonal Hat on that pattern. For the basic bulky hat pattern, use size 8 (5mm) needles. For the 96 cast on use the crown for the 80 stitch cast on. Hi! I was just wondering whether the body of the hat is only knitting until the crown or knit one row and purl one row until the crown of the hat. Thanks! It’s made in-the-round, so every row will be knitted. If I use size 10 instead of 10 1/2 needles, will the dimensions be a bit tighter, I assume? So if your pattern says it would fit a certain head circumference, I imagine it would fit a slightly smaller circumference with size 10 needles? One needle size with bulky yarn probably wouldn’t make a material difference. It might be just ever so slightly tighter, but with being stretchy would still fit the same size head. This is a beautiful beanie, I don’t as a rule wear hats of any sort, I might consider changing that behavior after I make a couple of these. I was looking for Christmas gift ideas for my family. thanks – this is just what I was looking for, to make with a soft fluffy yarn. 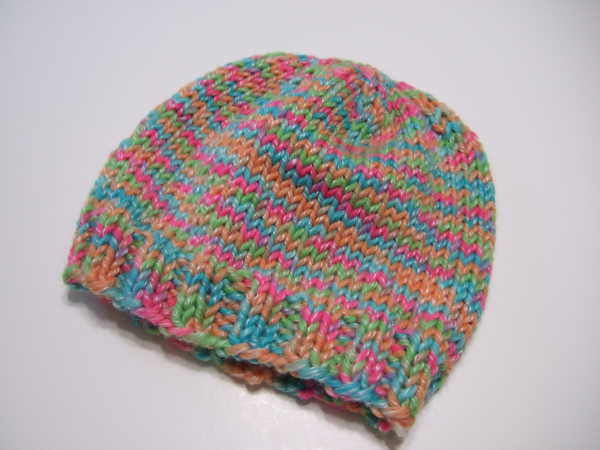 What is the name of the yarn used in the candy crush beanie hat….I went to Hobby a Lobby and couldn’t find it. I’m afraid it’s been discontinued. Maybe there are some supplies online at secondary sources. It is Yarn Bee Melody Bulky Wool Blend 102 Florals. Be sure you are including the k4 at the beginning and end of each repeat, so other than at the beginning and end of the round, you will have k8 between decreases. I love this pattern I bought some jumbo woll from aldi and adapted the pattern to fit my daughter.now doing matching one for my neice who fell in love with it! I know this sounds crazy, but I want to make the adult size (80 CO stitches) and can’t figure out the stitch set up. How would you break the stitches down over 4 needles? If I set up wth 16 stitches on each needle, as instructed, I end up with only 64 stitches, not 80. Thank you for any help you can give. 16-16-32-16. Total of 80 for large adult size. Hope this works on the decrease rows. You need to have a multiple of 16 on each needle so the needles will not have all the same number. One of the needles will have 32 on it. How would i adapt this to a roll brim? Replace the beginning ribbing with twice as much straight knitting. Add an inch to the measurement before beginning the crown. Love your pattern, made it for my 5 yr old grand daughter, it is easy to follow, knits up quickly and love it. My question is do you think it would look good with earflaps attached???? This would work well with earflaps since it is a very basic pattern. I spaced the gage swatch! Wanted to knit a hat for my neighbor’s son! OOPS! Ended up with an adult size hat as had 11 stitches (not 14) per 4″. NO problem, I realized it after I’d knitted the bottom (thinking it would be too small)! One modification I made was to lengthen the hat so the ribbed portion could be folded up to keep the ears warmer! VERY NICE! Thank you! Will be a gift for a family member at my great-aunt’s 100th birthday in March! I just finished the hat for 3 year old Henry! It turned out great! Thanks so much for the lovely patterns! He was thrilled with it, and wore it home on his walk with his parents! Thanks you for sharing your lovely pattern & helping us share the joy with others! Great pattern and modifications in the question section. All I need for 4 “emergency” AKA I need a gift for a family request from my son. Can I do this with a seam? If so are the instructions to decrease the same? Yes, just purl the back rows. You can follow the crown pattern for 60 stitches. You will repeat each instruction for the round 7 times.